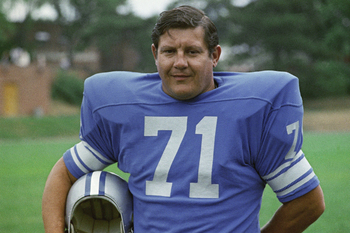 Alex Karras is a former All-Pro football player and actor. He is a household name in the U.S.
Karris was officially diagnosed with dementia seven years ago, and is taking the role of lead plaintiff in a suit against the National Football League. Karras and Susan Clark, his wife, are two of 119 people who filed suit today in U.S. District Court in Philadelphia, the latest complaint brought against the NFL by ex-players who say the league didn’t do enough to protect them from head injuries. As far as I can tell, more than 1,000 former NFL players are now suing the league. A growing number of well known sports figures, actors, and musicians have disclosed that they are suffering from dementia, or have died from dementia in the last few years. The list includes Glen Campbell, Pat Summitt, Peter Falk, Darrell Royal, and now Karras. This news and the growing number of public figures that are being diagnosed with Alzheimer's, and the various types of dementia, is sure to bring the issue of Alzheimer's disease into the forefront of public awareness.